"In addition, the tipster also provided a full spec sheet confirming a 1GHz processor, 8GB of storage, a 5 megapixel camera with dual-LED flash, quad-band radio frequencies, 802.11 b/g/n WiFi and more. More interestingly, in one of the leaked documents, there is also mention of "Dolby Mobile Sound"." My my. Wouldn't this smartphone be a nice companion. Although the HTC HD7 has been widely leaked in these days leading up to the launch of Windows Phone 7, every time we get to see it in a new perspective it looks better and better. TmoNews certainly seems to like what they see, and I agree. Wonder if we will actually get this in North America? Needs more RAM, 8gb doesn't make sense, especially when you can't add more. Especially when the device amounts to nothing more than an HD2 with a different shell and OS. Far from desirable IMO. I don't think that RAM matters really per se, especially in an OS that doesn't multitask and may be well optimized for what the device has. 8GB is indeed ridiculous though. There's no way I'll agree to such a tiny amount of non-upgradeable storage. And this is supposed to be a media- and game-centric device. Go figure. 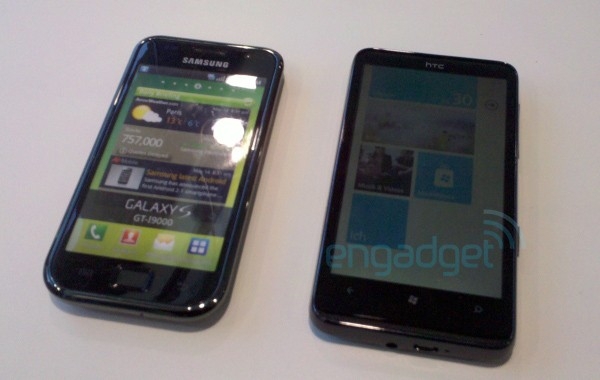 It almost appears like HTC doesn't want WP7 to succeed. I really am torn on this one. One the one hand it looks really nice, on the other it's not much of an upgrade (and in some cases this is a downgrade). I don't actually use very much storage, and even I can see running into that amount very quickly. Even so, 8GB is nothing. While you might have a lot of stuff in the cloud, much of it as a backup to your on-board files, 16GB should be considered a bare minimum -- though even that number is moving more towards 32GB. I do not know if this was MS idea but nevertheless it is a terrible idea. Up to a certain extent I could agree that the idea to sync devices through the so called cloud could be interersting but store all my data in the cloud? No thanks. Besides all the carriers are ending the "Unlimited data" plans so either way MS and the carriers concoited this idea, the former to gain support for the device and latter to squeeze even more money from users and in this case they will fall together or MS just missed foreseeing the end of these plans and this would be a further example of the lack of long term strategy by the upper management. Clearly though, the lack of removable memory is driven by the desire for increased profits. Inadequate on board memory = $ for 'Cloud Storage' and even more $ for the bandwidth necessary to access and store it. Obviously MS and the Carriers are hoping that the great unwashed public, not the WM cognicenti, will actually think this is a good phone, side by side with the iPhone. Good luck with that! "Windows Mobile 7 - Using yesterday's technology today, for a better tomorrow!"